Our dogs are friends who maybe started out as a “pets,” but soon became something so much bigger than what is contained in that one small word. If you’re looking at this website, you love dogs. And what’s not to love? Ok, I’m not crazy about the shedding, and I could do without “indiscretions” on my new carpet, but other than that, I adore them. I thoroughly appreciate how dogs always support whatever activity we may wish to pursue. My own dog, Guido, especially approves of my activities when they involve food. At those times he positively radiates support as he hovers around my feet hoping fervently that I will drop something. I usually oblige. People ask how I started painting dogs. It was because a neighbor had a really cute Norwegian Elkhound and I thought it would be fun to paint her picture. I took it with me to show a friend, and someone saw it and wanted to buy it. The paint wasn’t even dry. 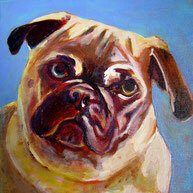 That was when I realized I ought to paint more dogs. So I did, and the more I painted the more fun it was. I do dog portraits because they make people happy, which makes me happy. Our dogs are members of the family. In fact, some of them are absolutely convinced that they’re the most important member of the family. Just ask them. I understand how much your friend means to you and that you want to celebrate his or her amazingness by having a fine art portrait painted, which you will then hang in a prominent spot in your home. I’m sure he or she will approve. Rest assured that I will do my very best to capture your dog’s unique charm.